Last Sunday night, friends gathered to work on a super-secret project and eat dessert. Chile-chocolate-rum pudding, candied ginger shortbread and muffins graced the table, and lo, everything was delicious. 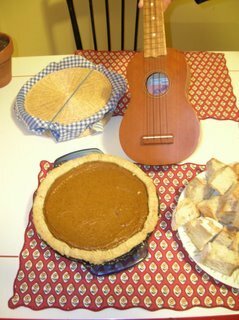 I made this very spicy pumpkin pie, which exactly matched the color of G's ukelele. My new thing is making crusts with about 1/3 wheat flour to 2/3 white, which seems to give a desired crumblyness. Nothing-in-the-House is providing pie inspiration, pie dreams, and I am pleased to up the pastrymaking factor of my tableside life. Got pie? Eat it -- then blog about it. 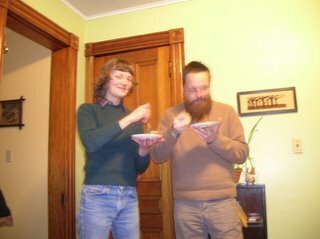 Here is a picture of Michelle and Greg in the "pumpkin pie enjoyment zone." Sky-high pie society over there, mmm-hmmm.